... collaboration to fulfill most effectively the ministry and mission of the NALC, normally based on common geographic boundaries. Such organization shall be done in consultation with the Bishop and subject to the approval of the Executive Council. Each regional group of congregations shall adopt appropriate governing documents that are consistent with the governing documents and practice of the NALC and shall include election of a Dean, adoption of a budget and provision for supervision, mutual support of member congregations and procedures necessary for carrying out its mission and ministry. "United in Thought and Purpose..."
The purpose of the Ohio Mission Region is stated on the "About Us" page, but bears a bit of history too. Ohio was originally unified as one Mission District under the North American Lutheran Church. It had one dean and grew to nearly 60 congregations. The duties of the Dean of the Ohio Mission District became more than was reasonable for one individual. Consequently, the Bishop of the NALC instructed the OMD to split as was proper and determined by the NALC Constitution. This directive occurred in 2014 and the OMD executive council worked diligently over many months to form a plan that would relieve the weight of the duties on any one dean while maintaining unity across the Ohio congregations. There were no guidelines or plans in the NALC Constitution for maintaining that form of unity. 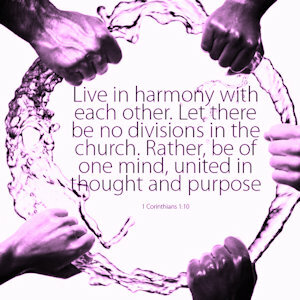 So, the OMD sought the guidance of the Holy Spirit in prayer and scripture to form a structural relationship that had not been previously conceived. As the OMD had 5 regional "Assistants to the Dean" each determined by geographic location, it made sense to divide the OMD along those lines. The transition to individual mission districts was not without careful thought and prayer though. Many details had to be given careful attention. The desire to maintain unity throughout the state remained in the hearts of the council throughout the process. Long-standing relationships, collaborative projects and cooperative efforts across the state drove this desire for unity which resulted in the formation of the Ohio Mission Region. This remains our driving purpose for existing. Here you can find the pictures, presentations, sermons, and handouts that were provided from previous OMR Convocations. Each year button will take you to a page with those materials.